Screen’s new radio DAB Transmitter is reaching the highest technology level in both Digital Signal Processing and RF domain. 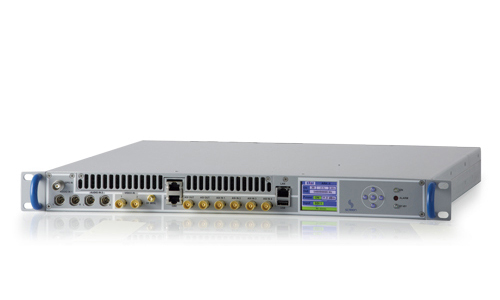 To meet and exceed all the Digital Radio International Broadcasters requirements, optimizing modulation performances in every working condition. more rugged and efficient, special low-loss design of matching and combining system, high-efficiency over 96% power supplies. All RF power modules are hot pluggable (both liquid and air cooled) for an easy and fast maintenance on site. All RF power modules are equipped with hot pluggable independent power supplies for maximum redundancy and easy selection of the operating mode between single phase or balanced three phases. The latest generation of industry higher class power supplies grants over 96% efficiency with wider input AC range capability and greater ruggedness. 4) Compact-sized amplifier modules thanks to a new concept of heat sync and ultracompact power supplies, both in air or liquid cooling systems. A 5 kW rms DAB Transmitter in a single rack is just an example of this extreme compactness. Latest generation RF combiner technology with ultracompact unbalancing dummy loads and a smart intercommunication interface between RF modules, drivers, and Logical Control System. 3. High power in extremely compact size and top-level efficiency. 4. Built-in SFN adapter and very advanced SWDT®, Software Defined Transmitters technology. 6. Typical MER >33dB at all power levels and in all channels with shoulders >37dB without mask filter. 7. Highly stable in SFN network, thanks to high-quality local oscillator working in combination with embedded GPS built-in receiver. 8. Total remote control through built-in web server SNMP. The internal web server allows an easy monitoring and configuration through a LAN connection and a standard web browser. 9. 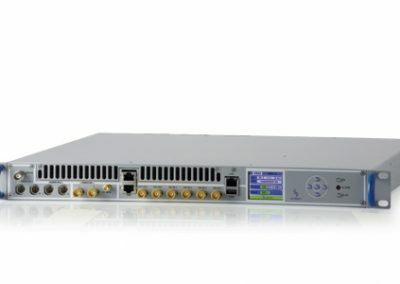 High reliability, scalable and flexible configuration modes: dual drive, passive standby or N+1. 10. Liquid or air cooled. • Frequency range: VHF (III) 170 MHz to 255 MHz, L band on request. • DAB-Modes: I, II, III, IV. • Network type: MFN, SFN. • Reference Standard: ITU-T G703-G704, EN 300401, EN 300799, EN 302077-2. • Typical MER >33dB at all power levels and in all channels with shoulders >37dB without mask filter. • Integrated GPS/Glonass Professional Receiver. • Built-in high stability OCXO. • Seamless switching between EDI/ETI inputs without broadcasting interruption. • Integrated SNMP management with events log. • Digital linear adaptive pre-correction. • Digital non-linear adaptive precorrection with automatic curves loading for each channel and power levels. • Wide Range Power Supply 90-264 V AC (3 phase) in fuse-free configuration (SW Standby Switch). • Quick-acting protection circuits against overpower and direct/reflected power. • Protection against reflected power with automatic fold-back. • Security Authentication for GUI access • High Definition Color Display.